In the checklist, I recommend that you establish whether the physics of your world are realistic or stylized, but when I went to my 15 existing checklist roadtests, I was surprised to find that all 15 fell in the “realistic” category (even in The Bourne Identity and Iron Man, the physics are relatively realistic, compared to similar movies in those genres). 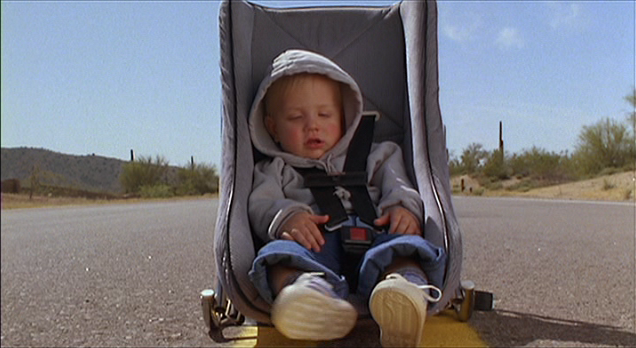 But Raising Arizona introduces us to the world of gentle physics. This is most obvious in the blessed life of Nathan Jr, who manages to fall of the roof of a car and endures many other hardships without so much as a scratch. So how does a movie get us to accept stylized physics? By creating a very stylized tone right away. Star Wars uses its famous fairy-tale title card to temper our expectation of realistic physics in that world, and this movie does something similar with its banjo-and-yodel opening music and shaggy-dog-story narration. This establishes a mood that might be described as “tall tale” or “folk ballad”. This also brings us back around to the light consequences of this movie that we discussed last time. This is a movie, after all, in which a couple steal a rich man’s baby easily, just by putting a latter against his house, then return it the same way, even after he’s on his guard, and when he finally catches them in the act, he just says “aw shucks, that’s okay,” and gives them advice on how to save their marriage! Usually, audiences demand that movies reflect the way the world works, and that have real consequences for the characters’ actions. We want these things so that we can believe in and invest in this world, so that we can play along in our seats and try to guess what might happen, secure in the knowledge that the movie will “play fair” with us, and not give itself an out that we couldn’t have guessed. But this movie alters those expectations very quickly, creating a surreal space in which we shift to a more child-like type of viewing. Here we will receive a different sort of comfort: instead of the reassurance that things will conform to our understanding of behavior, this offers us the reassurance that, thought we’re in a absurd and unpredictable world, at least we’re in gentle hands, and nothing that bad can happen, even when babies go flying off of car roofs, and likable kidnappers get caught red-handed.